This error indicates a problem with Microsoft .NET Framework 4 Full, which is a necessary prerequisite of Yesware for Outlook. All users must have .NET Framework 4 Full installed to properly run the Yesware COM add-in for Outlook. 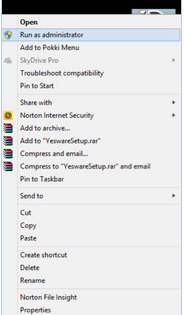 Yesware's installation tool attempts to do this automatically when the Yesware add-in is downloaded. However, network connectivity issues, limited hard-drive space, or lack of the proper IT permissions could cause the process to fail. If you continue to encounter this error, try to install .NET Framework 4 Full directly from Microsoft. Once .Net Framework 4 Full has been successfully installed, attempt to install Yesware add-in for Outlook from our website. If you believe that you’ve successfully installed the .Net Full package installer, but is still receiving the error message, find the .Net 4 Full package on your hard drive, delete it, and then reinstall the .NET Framework 4 Full using the link above before trying to download the Yesware add-in for Outlook.